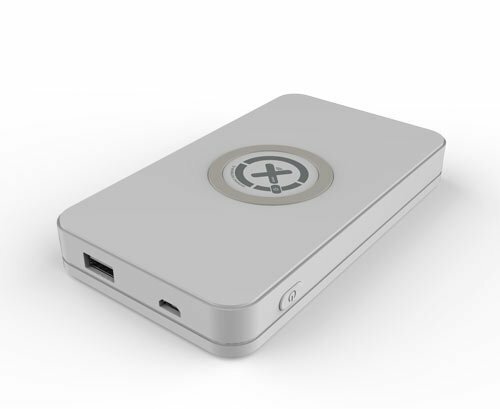 This Wireless Power Bank charges your Qi-enabled mobile device wirelessly. With this technology you do not need a charging cable to connect your mobile device. Place and charge! The wireless Power Bank 10.000 is equipped with an internal 10.000mAh li-ion battery. The Power Bank contains enough energy to charge your smartphone up to 4-5 times. With this indispensable accessory, you can simply recharge your mobile device anywhere you go. In that way you can provide your smartphone and/ or tablet with extra energy anywhere you want. The LED indicator of the Power Bank provides you with the energy (still) available. By using the provided charging cable the Wireless Power Bank can be recharged directly by USB or AC. In order to use wireless charging you need a wireless charging enabled device. The technology Xtorm uses is called “Qi” Compatible devices are e.g. Google Nexus 4+5, Nokia Lumia 920-928 en higher, HTC Droid DNA, Samsung S5 en higher. More information can be found on: www.xtorm.eu/qi This Wireless Power Bank 10.000 is ideal for business travels, holidays and daily use. With this manageable mobile charger you are always equipped with a back-up battery whenever and wherever you need it.